For a democratic secular Iran. For peace and prosperity in the Middle East. : UNTIL I AM ALIVE! Deutsche Welle: For the last nine years, every year you try your hardest to hold the commemoration worthy of your murdered parents, and every year the Islamic Republic authorities put up more obstacles in your way, I simply want to ask you until when will you continue your persistence? Parastoo Forouhar: UNTILL I AM ALIVE! I told the ministry of intelligence agents too, until I am alive I will continue to come to Iran and try to hold the commemoration ceremony for my parents. Every year I will try to keep their memories alive, and I am just a small player amongst many many people who share this effort with me. As my parents' daughter however, I take the first step. On this very day, many people have phoned me saying they have come all the way from other cities but we have not been allowed to get near the house and take part in the ceremony. Others have phoned saying we are in the nearby streets and although we can not come near the house, we will hang around, know that we are with you. All this shows that the memory of my parents will live on, and until I am around I will do my part. Every year the Islamic Republic has put more restrictions on Parastoo Forouhar, the daughter of the murdered Iranian secular dissidents Dariush and Parvaneh Forouhar, to hold public commemorations on the anniversary of her parents's extra judicial murder. 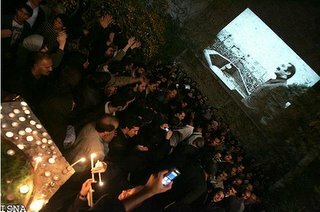 Last year, the authorities banned the commemoration from being held in a public place and the ceremony was held in Forouhars's home instead. Despite these restrictions, giant slides displayed images of the Forouhars to large crowds gathered outside their home and in the nearby streets. This year, the authorities have put up physical barriers and fences, to stop anyone from going anywhere near the house. Even relatives and close friends have been prevented from entering the house. Every year on the anniversary of the Forouhars, I remember a conversation I had with Arash Forouhar, the son of the late Forouhars, who was describing to me the events during the funeral of his parents, which was attended by tens of thousands of Iranians. During the funeral people were holding Iranian tri-colour flags but with a X in the middle instead of the Islamic Republic un-Iranian symbol now in the country's official flags, as a sign of protest. Just before laying the coffins to the ground, a working class woman with her chador wrapped around her waist and arm, stood in between the coffins and shouted 'People, do you know why there is no Sun and Lion (the true Iranian symbols that should be on our flag) on these flags that are draped over the coffins? Its because the Sun is inside this coffin, pointing to one coffin, and the Lion lies in that one'. wow! this is so sad! But they will pay for it. Very moving, especially that last sentence. Doroud bar shahidane rahe azadi. I dont think you can enforce you opinion on a whole nation. I am not saying i hate democracy but there is a big difference in democracy and secularism. You want to see iran as secular nation so its your opinion and we respect it but right now what we know is that Iranian nation voted for Ahmedinejad and hence he is the democratically elected president of the country. Can you tell me how you define liberal islam? Because you people use this word quiet often for islam and islamic countries but you dont go into detail as to what is the difference between the only islam i know and the liberal and moderate islam of yours? when did I say anything about liberal islam?? My friend I think you imagine a lot of things and I am worried about you. Particularly when you imagine that the Iranian people voted for Ahmadi-nejad, even the regime's own clerics cried out fould and election fraud but you are so "pure" you let your imagination run wild!! it may do your "pure" imagination some good! yoou M Junaid khan...Let me ask you Where in the world do u live ? just answer me this quetion plz? and I will explain it to u y I ask these? One should ask her why her dad participated in a revolt that brought her dad's murderers to power? I don't think children are accountable for their parents's action Winston, and if those who misjudged 28 years ago have paid with their blood, like the Forouhars have, we can move on to what our issues are today. well, Mr Winston, I dont think we should be worry about the past! Like Azarmeher said lets worry about today! And believe me if those parents wouldnt be there yesterday we wouldnt be here today! I like the dream of the future beter then the history of the past! That's true but sometimes I just can't forget the past and forgive those who brought this upon us. Again, it is me! Everyone shares the responsibility of what happened 28 years ago, including the Shah and those who worked for him. Some more, some less, some have paid for it with their lives and some like General Gharrebaghi, never even regretted their disastrous decisions. Most of Shah's men, who had benefitted so much in the past, went on with their lives and never liftef a finger against the mullahs afterwards. The Forouhars, however paid the ultimate price. The Shah‘s men were those thousands of officers and ministers and other employees of the government who were executed in the time as the prime minister of the Islamic Revolution was Mr Mehdi Bazargan and the Social minister of the Islamic Revolution was Mr Forouhar. Unfortunately most of Shah’s men are not among us and therefore they can not fight against the mullahs. I know that Mr Forouhar has paid with his life, but this means not that we must forget the facts and the responsibilities. we talked on the phone a few month ago (Schahram from Germany, about a new website, rememeber?). Please can you help to spread the following link? Very important for all Iranians! just imagine, all Iranians could express their opinion about the political and cultural situation in our country publicly and online! Not tomorrow or in a few years, but right now!!! I have constructed a website with about 40 most important questions about everything we want to know. If the poll is sucessful, just if 100 000 people would take part, than .. you can imagine, how you could use the results in the press. German papers already have shown interest in my work. The poll has started today on November, 27, 2007. Please forward my website adress below to so many people, TV stations and radiostations in the wordl! Please take your time to answer all the questions carefully, I think, this would be the first time in our history with such possibilities after the revolution. my view is to find out in an objective way about the real opinions of Iranians. who dispersed over the world since 1978/79 really think about the revolution, about religion,? resonance was amazing, so I decided to go ahead with this second project. to everyone, who would be able to take part in this survey, and, is it possible to put a link to the survey website with the on your website at least temporary? I think the results can be very interesting for all of us! And could you at least confirm that you got my mail?